Lollies and Candies bring back memories of our childhood. Small sweet treats served on sticks to improve their visual appeal, Lollies and Candies are enjoyed mainly by kids – and sometimes adults too. We have included all-time favourites like Strawberry Lollies as well as innovative options like the Oats Lollipop . Fruit and yoghurt, frozen to make a healthy ice-cream which your kids are sure to love. Chocolate waffle cones filled with candies are a sure bit. Ordinary ice-cream cones can be used instead of waffle cones. Unlike candy lollipops, you wouldn’t mind your children eating these. 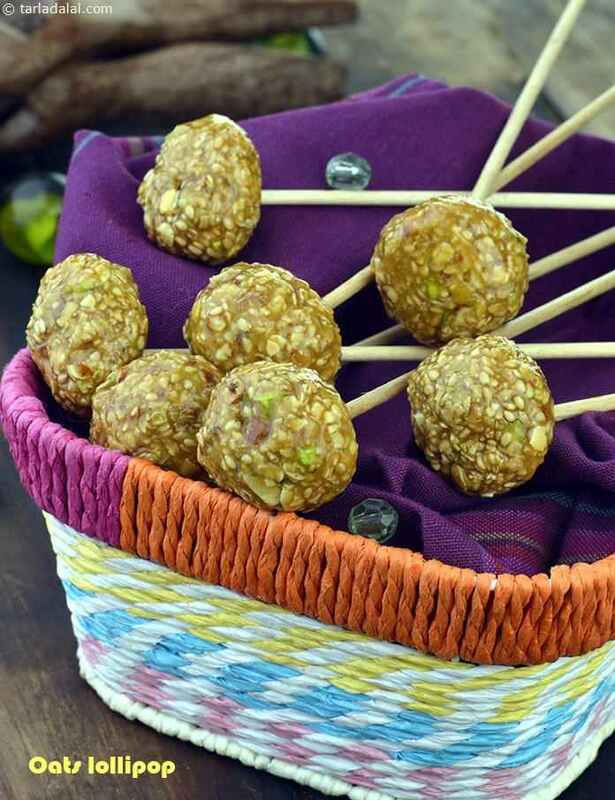 The oats, jaggery, nuts and sesame seeds all blend in nicely to make these lollipops crunchy and delicious. You can make them in advance and store them in air-tight containers. Fruit and yoghurt, frozen to make a healthy ice-cream which your kids are sure to love. A kid friendly and appealing biscuit or cookie recipe, Lollipop biscuits are easy to prepare. The dough made from flour, sugar, baking soda, margarine and milk is rolled and then cut into rounds. These rounds are then baked and then served with jam on the top. This is a chocolate filled popcorn with some nuts and dry fruits. It will be well enjoyed on children birthday party.Relish with this popcorn on your kids' birthday party.